Novel, "different", or current projects (excluding the "everyday stuff"). Cape Diving and Swift Engineering contracted Triton to design, draught and 3D model the SAT DIVE LAYOUT onboard the Greatship Manisha, a vessel currently under charter by PetroSA. The project included designing a main mezdeck and upper mezdeck which supports all of the 250+ tonnes of SAT Dive equipment, in the form of Saturation Chambers, Dive Control Vans, Workshop and Stores Vans, also included the design of a moonpool guide system for launching and recovering the Dive Bell through the moonpool (vs over the side in its previous implementation. 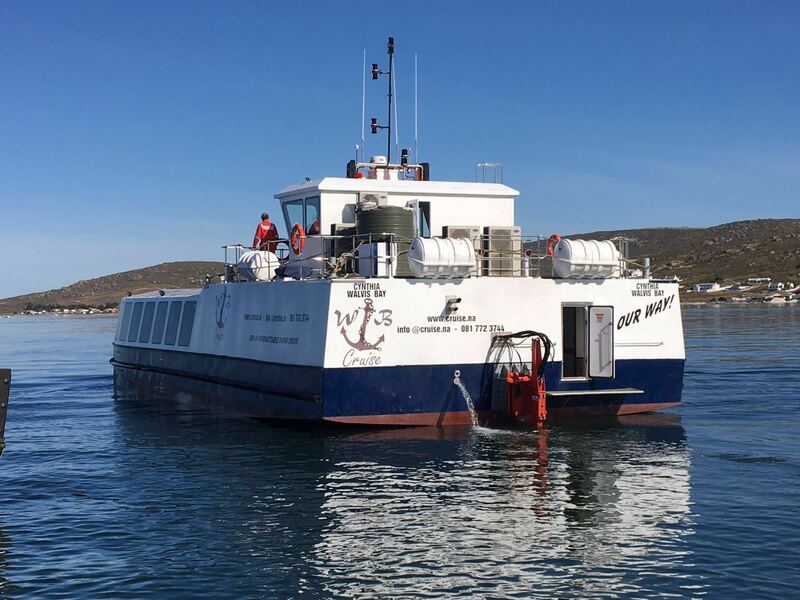 A new 27m GRP Restaurant Boat was designed for WB Cruise CC, and built by Tallie Marine, for operation in Walbvis Bay, Namibia. She commenced operation on the 13th Nov 2016. For more information see RESTUARANT BOAT or their website WB CRUISE. 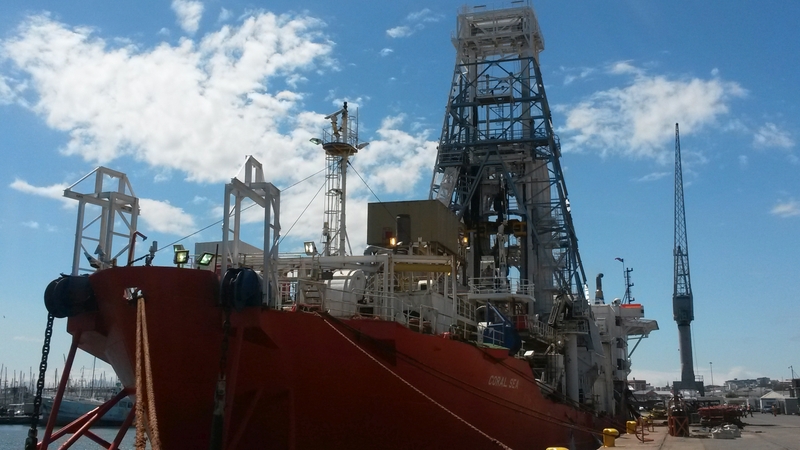 ThE past two years have seen another 5 Debeers Mining Vessels completing plant refits culminating in Inclining Experiments and new Stability Documentation being calculated for Class approval, by Triton, with Triton also supplying their Onboard Stability Program, with the exception of NUJOMA, (Debeers' New Vessel), which Triton Inclined for the designers who completed the Stability Book themselves. Triton who was previously responsible for a propulsion refit on the Transhipment Barge "PEG" for KENMARE at their Mozambique Mineral Sand Mine, we again involved in a bulk cargo refit, to allow the vessel to take on product from a third party source and return it to the Moma Mine (a reverse process to its standard function. Triton were involved in the design of the bin hopper, chutes, conveyor so as to discharge into a deck deck mounted slurry hopper (designed by others) to allow for the discharge of slurry product to the Moma Jetty and back to the Mine. 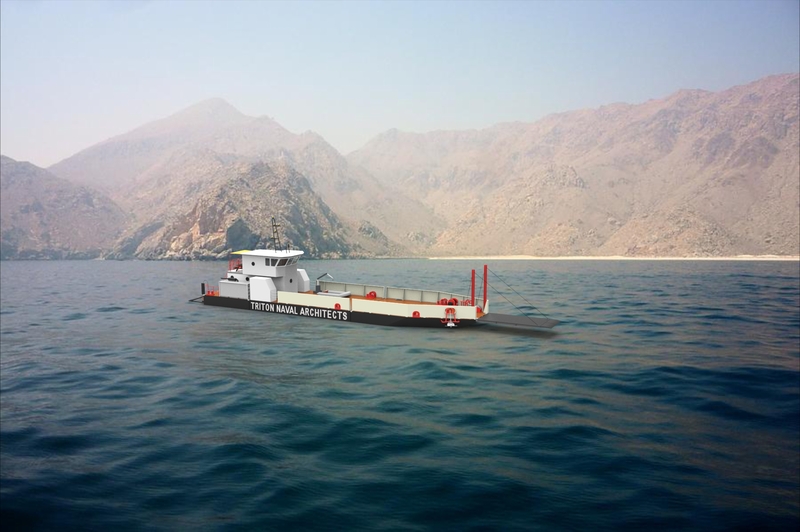 Triton has developed the design of a series of Modular Self Propelled Manned Barges, either for river or sea applications, for the purpose of transporting cargo fuel, cargo water, deck cargo, vehicles or a combination of all. Triton offers these barges on a turnkey basis, by teaming up with Nico Engineering for the fabrication, and Hydro Armor for the propulsion units. The vessels are designed and built with a view that they can be premanufactured in their entirety, and shipped as modular units (suitable for Container Ships and Container Trucks), and then assembled and commissioned onsite. This makes them suitable for virtually any destination. 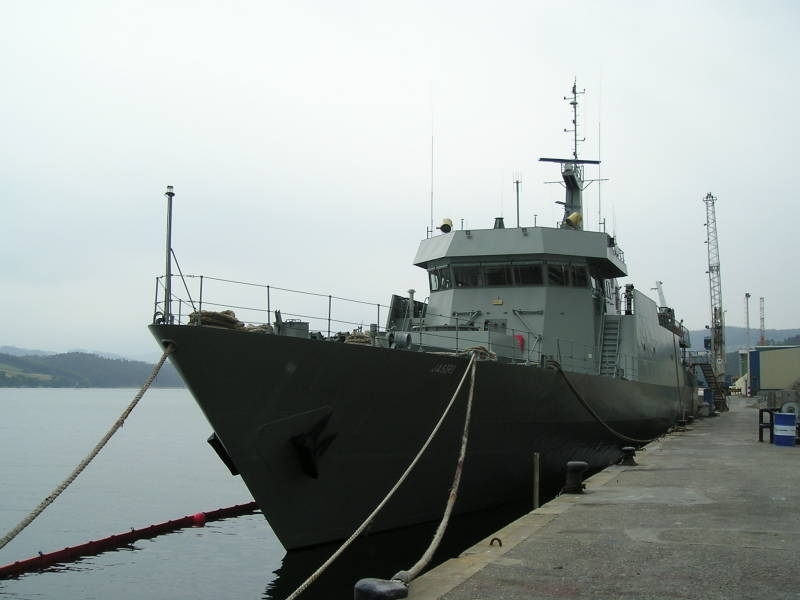 The vessels have a fully outfitted accommodation and bridge, and are propelled by deck mounted Hydro Armor Hydraulic Power Packs, driving 130deg or 180deg Rudder trimmable, tiltable propellers. 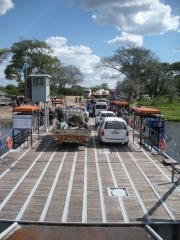 They are either fitted with bow or side ramps for the loading of cargo and/or vehicles, or to allow access of forklifts to assist in the handling of deck cargo. 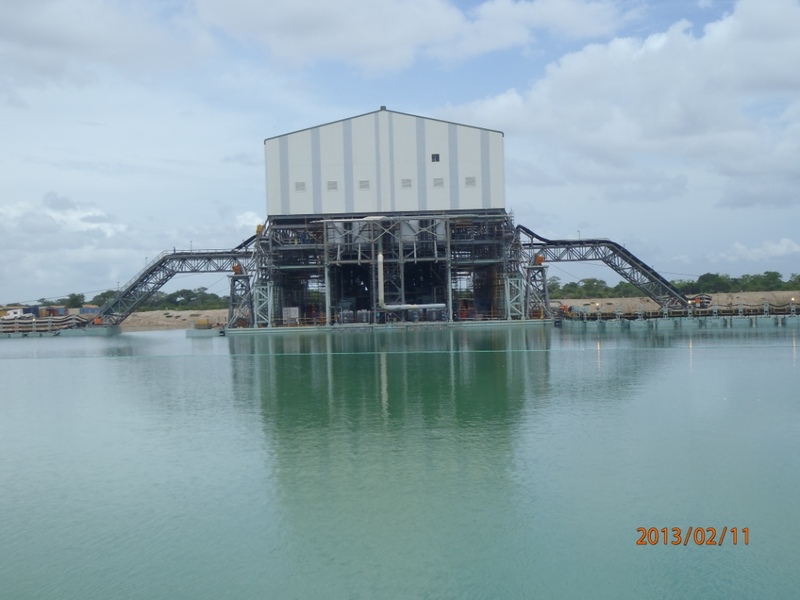 Over the years Triton has been involved in various Mineral Sands Projects. The most notable being the design of the Self Loading, Self Unloading, Self Propelled, Bronach-J in 2005, Built in Singapore. 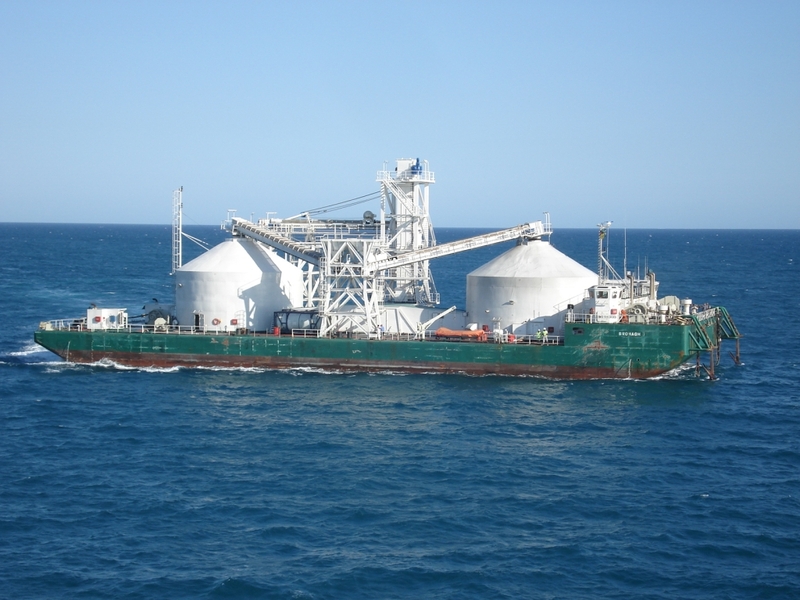 This being sea-going Transhipment Vessel for Kenmare Resources for the transhipment of mineral sand product from their jetty to awaiting bulkcarriers. We were furthermore involved in the modification of their second transhipment barge, The Peg, in 2011. Other involvement in Mineral Sands projects included the structural and stability design of all floating aspects and strongbacks for the Wet Concentrator Plant B for Kenmare Resources in 2011-2012. Other more distant involvement has been for the likes of HATCH, ANGLO, for Richards Bay Minerals and Namdeb on their Floating Treatment Plants. This 2014 refit to the DEBEERS Diamond Mining Vessel, involved the replacement of the Aft Port Chain Mooring System to that of Wire Rope System, with the Winch being installed in the modified chain locker space, requiring a vertical tower to aid the fleet angle, coupled to deck bend sheave and new fairleader. The installation of the 52tonne winch in the chain locker below decks required that access be cut through the ship's side and that it be rigged through that hole into position whilst in drydock, with all structure being reinstalled as required. The tower, bend sheave and fairleader also required significant underdeck strengthening on the boat deck and below, to support the high forces. The refit also involved the fabrication and installation of 12 additional accommodation containers, designed and installed to Class. Various other scheduled maintenance activities also took place during the Inport and Drydocking. The project was culminated in Dec with the final Inclining Experiment and Stability documentation being drawn up for Class approval. This catamaran shaped accommodation and supply vessel, chartered by BP, to offer crew accommodation and support for their Central Azari Oil Platform, off Baku in the Caspian Sea, required stringent dynamic mooring analysis, to ensure compliance for both Alongside the Platform, for servicing an articulated motion compensated gangway for crew changes, or whilst standing off, for severe weather scenarios, each with their own set of minimum requirements. The analysis being performed to DNV-OS-E301 and API Rp 2SK requirements, and approved by the BP Houston office. The 8 point mooring catenary spread made more complex by the very long, multi section mooring lines, comprising of chain, wire rope and dyneema fibre arranged in such a way as not to infringe or make contact with various subsea assets including gas and oil pipe lines, coupled to severe metocean conditions including 9m Significant Wave Height conditions (in certain directions). The analysis was performed as a Hydrodynamic Diffraction Analysis followed by Time Domain Analysis, using the ANSYS AQWA software suite. Over the course of 2014, Triton was contracted to perform various extended motion analysis on all of the DEBEERS Marine Mining Vessels, including the new vessel currently being built in Norway. 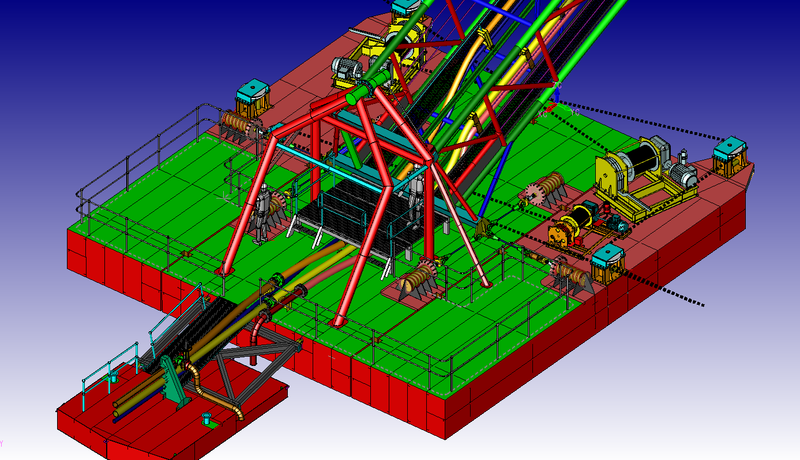 The purpose of these motion analysis, was to establish a single parameter dynamic design factor applicable to each vessel for a given location of operation, for use in all design calculations pertaining to current and future mining plants, drill towers etc. 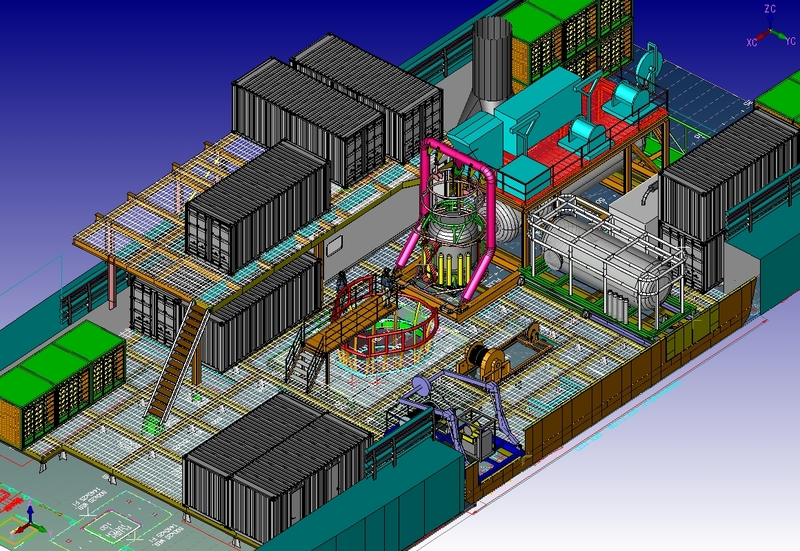 These analysis were perform on Triton's inhouse Motion Simulation Software. Throughout this 2013 refit involving upgrading the 600mm system to a 700mm system, weight management was critical. Various important decisions hinged around eventual displacement and deadweight Capacity, for Loadline, and also Stability Compliance. 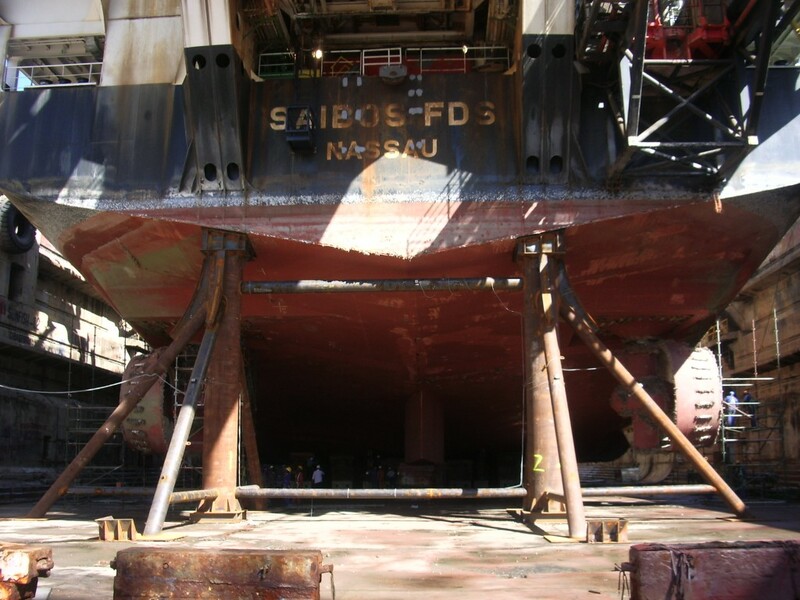 Hence a Deadweight Survey was conducted on arrival in advance of the refit, and the results were included in many weight and stability simulations (and motion studies) to govern decisions regarding the fitment of platforms and solid ballast. The project was culminated in Dec with the final Inclining Experiment and Stability documentation being drawn up for Class approval. Triton designed and analysed Stackable Docking Frames, for DORMAC, that can be used to accommodate varying heights and varying hull interface angles. See images in right column (bottom). Height is varied by adding or removing stackable sections, with fine tuning and angle adjustments done via the customized wooden capping. Triton recently completed a static and time domain, CALM Buoy Mooring Analysis, for PetroSA and Cape Diving, using the Bureau Veritas software Ariane7, and NR 493. 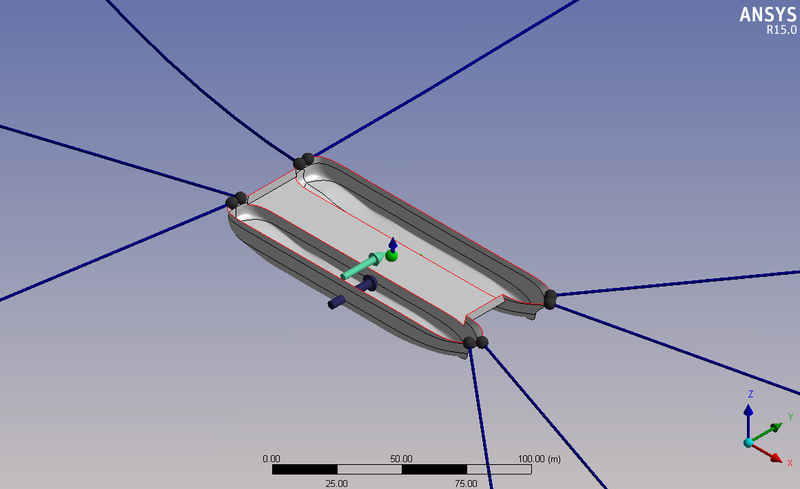 Triton are currently designing floating walkway structures, as well as bridge and pontoon structures for SNC Lavalin, for their Grande Cote Wet Plant Project. This in a similar vein to Triton's involvement in the EPC / KENMARE Floating Treatment Plant project of 2011, following on from previous projects for RBM and Anglo America, also involving dune mining. The bridge / pontoon interface allows for all degrees of freedom in that the bridge is suspended from an A Frame on the pontoon, and then tethered with 6 high capacity springs, on the deck of the Pontoon. The Western Challenge is a Ore Transport Barge, aquired by Kenmare (owners of the Bronagh J, Transport Vessel, designed by Triton, also featured here). The PEG was refitted with additional 2x500kW thrusters and engines, which together with her existing fwd pump jet type thruster will improve her manoeuvrability, both with and without the assistance of her tug, Sofia III. She was also being fitted with Loading Hopper and Conveyor system, as well as Yokohama Fenders and Davits, and other additional mooring gear, to bring her into operation as a 2nd transhipment barge, assisting the Bronagh J in transporting titanium sand between Moma and awaiting Bulkcarriers. Triton were contracted to do the design work, and SA Shipyards (Durban) were contracted to do the refit. The thrusters and engines were supplied by Hydro Armour (French) via their South African support office, Basic Hydraulics. The Theo is undergoing a major conversion and plate renewal process in Cape Town. The conversion includes but is not limited to the installation of a Moonpool, Self Compensating Winch and Tower System, Crane Installation etc. The winch and tower were designed by Denith Engineering, with the moonpool and all supporting structures done by Triton. More detail may be uploaded in time. The Magsenger 2, is a brand new 250mx60m Bulkcarrier, which underwent engine problems on maiden voyage that necessitated the removal and replacement of the lower crankcase. However the more tricky part is the engine weighs 360 tonnes, is 3 decks high, and the ship was built around it. The lower section to be removed weighs some 140 tonnes, and the upper section, once stripped down, which needs to be lifted and suspended, also weighs about 140 tonnes. Hence significant support mechanisms had to be put in place. This is where Triton came in, contracted by Dormac, who were the main ship repair contractor. Triton were tasked to perform all the design and analysis works necessary to lift and support, jack and move the relevant large mass components. These various design drawings and reports then distributed for review and acceptance by third parties. These modifications included the necessity to cut a large access hole in the bulkhead that separates the engine room and the 7th Hold, to allow the replacement parts to be lifted out of, and into, the hold and then slide into the engine room on custom designed rails and bogey systems. A more detailed project description along with analysis plots will follow when time allows, but in the meantime, some project photo's can be see on HERE. A generic sampling system was developed through a series of concepts, through to detail design and fabrication, whereby the unit can fit onto any applicable Offshore Supply Vessel / Anchor Handler, for NMP (Namibian Marine Phosphates, Pty Ltd. The system recovers samples from the seabed up to 400m waterdepth, using a custom designed Grab (by Arlona Engineering) and is handled via a A Frame, and Winch Tower, Hopper, Conveyor Unit, to allow for bagging on deck. Triton were the principle design contractors and project managers. Basic Hydraulics and Control System were responsible for the design and supply of all hydraulics and control components of the system, and worked with Triton in a close and all inclusive arrangement, with the owners themselves. This arrangement extended through all the concept design phases leading up to detail design, fabrication and installation. BELMET won the contract for fabrication, workshop installation and onboard installation. The system has been installed on the Smit Madura for its first sampling excersize. Triton, working together with (initially Akersolutions, and then EP-C) are responsible for the pontoons and strongbacks, along with all other deck foundations, that support the new Floating Treatment Plant for KENMARE, for the Moma Titanium Dune Mining Project. Areas of responsibility included, the pontoon structural design, structural interfacing with column loading from the plant above, flotation, stability, mooring etc. Analysis works include global model floating analysis with global bending, plus local modelling of strongbacks structures with prescribed bending and external loading, in static stress and buckling. See dedicated page HERE for more detail. A novel idea for low cost, transportable barge is this Tristan Barge, using the concept of connecting plastic floats tied together with a strong lattice structure frame and wooden deck. This barge has a 20tonne carrying capacity and has already been highly successful at the island of Tristan, in the use of transhipping cargo between visiting cargo vessels and the harbour, where draft limitation restrict access by those ships. It was also easily transportable to the island and could be launched from a single point lift from the ship. With Salvage companies or salvage operations often in need of a means to apply large shore based forces on a structure, or standard ship, or even capsized vessel (like the case of the Laverne which capsized in the harbour), Triton (together with Basic Hydraulics) identified the need to develop the design of a 100t Chain Puller. Such chain pullers could be used in isolation or any number coupled together through a common control system. This project was largely conducted as a student intern design project (under taken by Morne Le Roux of Stellenbosch University) included the concept design, structural analysis, hydraulic equipment, such that should an inquiry come in, Triton together with Basic Hydraulics could go into production at relatively short notice. Triton regularly takes on engineering / naval architectural student interns, particularly from foreign universities, for example a number have come from Germany, Holland, USA, France etc, with their longer intern periods (4 to 6 months), which are often preferred over the shorter requirements (3 to 4 weeks) of the local universities. 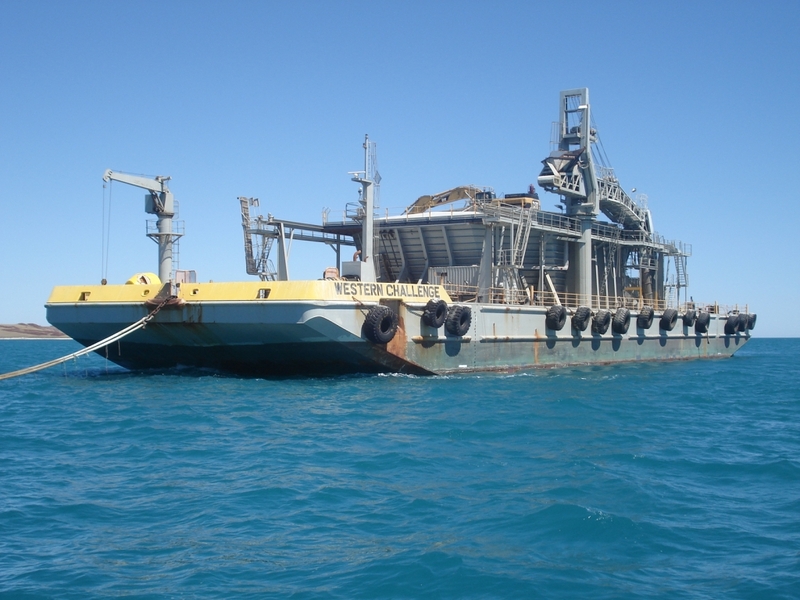 The double skin SMIT LIPUMA fuel bunker barge was designed by Triton, and build by Dormac in Durban. She was launched in Nov 2007, and due to come into service early 2008. The design of the double skinning of the existing Pentow Energy, has been completed, with construction due to begin early 2008. A self loading, self unloading, self propelled manned barge was designed, for construction in Singapore. The barge is to be ABS classed, and transports 4000tonnes of Titanium based raw product between a custom built jetty near Moma, in Mozambique, and discharge in an awaiting handimax bulk carrier, some 7 to 10 Nm offshore. Typically 10 trips between the loading jetty and the bulk carrier would be required, to load the ship. Some 600 000 tonnes of product is expected to be shipped per year. Triton Naval Architects were contracted by Price Waterhouse Coopers (Kenya) to assist in the dispute settlement over the procurement of the new build Lloyds classed, Naval Vessel "Jasiri", built in Spain for the Kenyan Navy. An ongoing involvement between 2007 and 2010/11. In Jan 2006 saw the eventual docking of the FPS SAIBOS, after much pre-planning w.r.t. to docking block arrangement and the design and analysis of a stern frame, which would be capable of supporting 2000 tonnes at 8m above the dock floor. Due to the ship have a significantly large folding stern tower, it was deemed necessary by the owners that the stern should be supported by a dedicated frame capably of such support. The ship had never previously been docked with the stern tower installed. She was again docked in Cape Town in June 2010, using the same concept, but a rebuilt stern docking frame. 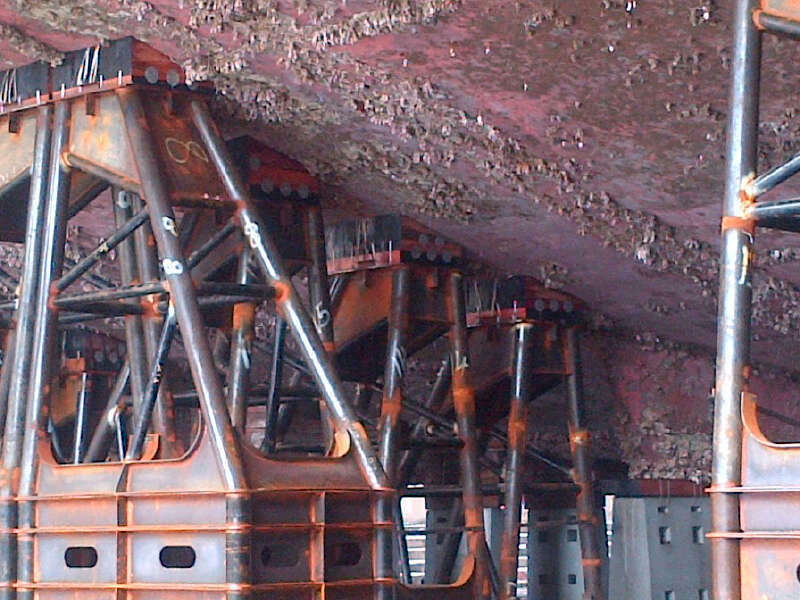 This frame was also due to be stress monitored "live" during the docking process, using submerged strain gauging, installed on the frame, ahead of flooding the dock, all conducted under subcontract by Origen (Hout Bay). Non-linear dynamic (time domain) mooring analysis were performed on a number of Oil Rigs and FPSO's as listed below. These were all analyzed for moorings for extended periods of stay in Cape Town, Walvis Bay, Saldanha Bay, Mossel Bay and lastly Caspian Sea and assumed 10yr, 25yr, 50yr and 100yr return wind and gust speeds, as applicable, or other applicable client supplied data. Most requiring foreign third party approval. The CALM Buoy is a permanent mooring off the coast of Mossel Bay / Agulhas. These were all TIME DOMAIN dynamic analysis, which would then predict peak line tensions, dynamic bollard reactions, dynamic fender reactions and displacements off and along the quay. Single line failure analysis would also be performed, as required by the various approval authorities. The offshore moorings cases would be analyzed for compliance against compliant with DNV os-e301_2010-10 and API RP 2SK and analyzed for both Diffraction Analysis (motions) and in the Time Domain (for dynamic prediction of mooring line responses and vessel offsets). ULS (Intact), ALS (Single Line Failure) and Transient Analysis (dynamic response prediction during line failure) is performed. Statistical Analysis of time series results are performed according to the requirements of DNV os-e301_2010-10. Triton has also designed numerous fender barges and docking frames, customised to the specific quay, so as to maintain the required fendered distance off the quay. 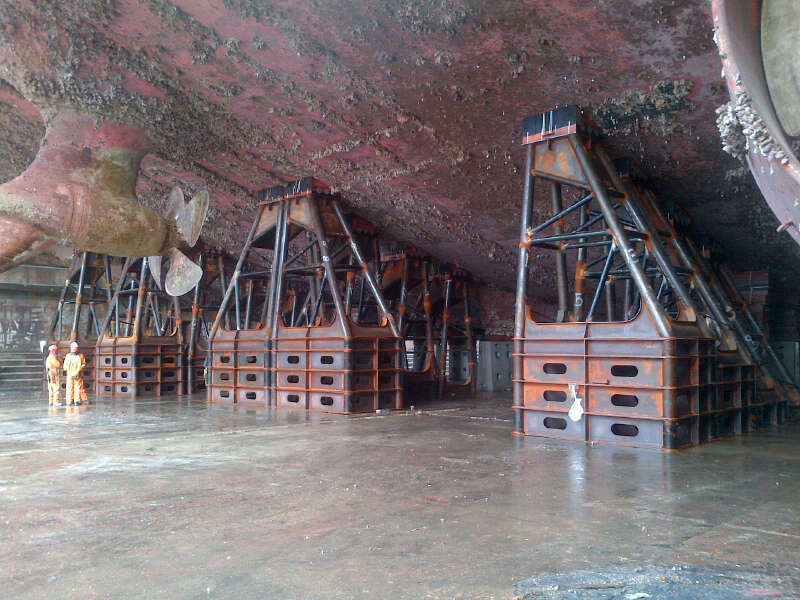 Many of these frames are semi submersed to allow the semi submerged hull of the rig to bear directly against the frame which in turn, bears directly against the quay wall, at that same level. Click here for an example. CYNTHIA- New Restaurant Boat, designed by Triton, and built by Tallie Marine for operation in Walvis Bay, Namibia. MODULAR SELF PROPELLED CARGO BARGES, 100t version shown here. GREATSHIP MANISHA - SAT DIVE SPREAD - project 2017. Click on image. CORAL SEA. Post 2014 Refit - Re-Inclined and ready to proceed to sea. QURBAN ABASOV - Dynamic Mooring Analysis for BP in the Caspian Sea, using ANSYS AQWA..
JASIRI - Naval Corvette / Patrol Vessel built for Kenyan Navy - TNA assisting PWC in dispute settlement.